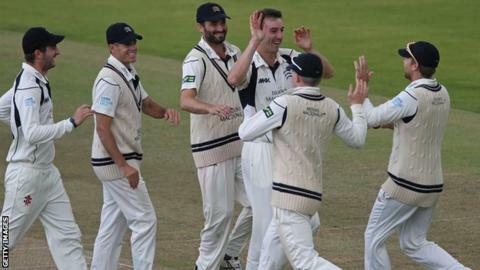 Coach Richard Scott says Middlesex can improve further following their second place in the County Championship. The Lord's outfit only lost two first-class game this year but finished 68 points behind champions Yorkshire. "We only got 29 batting points, and one from the last four games of the season, which isn't good enough," Scott told BBC London 94.9. "If individuals look at their performances over the year, a few will say they have scope for improvement." Middlesex were the only side to beat Yorkshire in Division One this year, as the White Rose county set a record of 11 top-flight victories. "We have a lot to be proud of in the Championship and winning the epic game at Lord's against Yorkshire was probably the highlight," said Scott. "With Nick Compton the only one going past 1,000 runs and James Harris the only one past 50 wickets, there is improvement for most to be made next year. "I am sure the club can be proud of what we have achieved this year and be excited about how far we can go in our quest to win a trophy next year." Middlesex ended the campaign with a loss at Worcestershire, with Scott describing their defeat by an innings and 128 runs as a "bitter note". "It will take a couple of weeks of reflection to understand what went wrong," he said. "It was by far our worst performance of the season as we were outplayed. "We made a decision in August not to have an overseas player for the last month of the season and generally we coped and won cricket matches. It caught up with us."